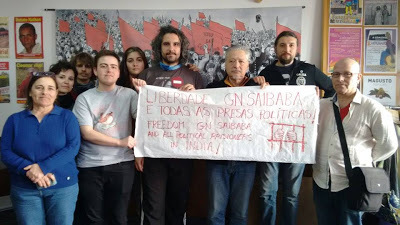 Greece: Freedom and Justice for GN Saibaba! 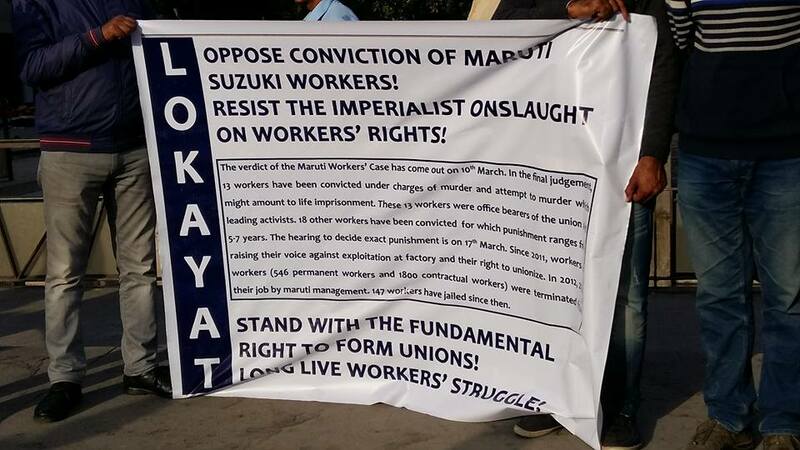 iLokayat organized a protest demonstration against the conviction of Delhi University Professor G N Saibaba, Hem Mishra along with other four persons and also against the conviction of the Maruti Suzuki Workers on Wednesday at Sector 17. 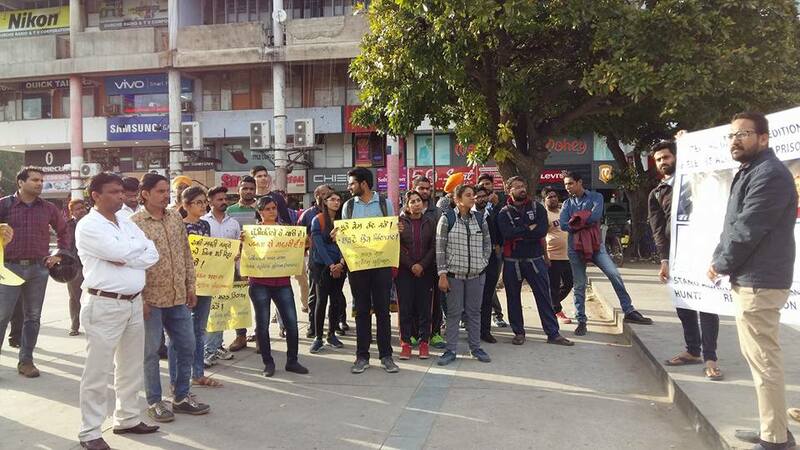 Apart from Lokayat, Students for Society (SFS), People’s Artist Forum (PAF), CPI (ML Liberation), AISA, ASA, PSU (Lalkar), PUCL, IAPL, Naujwan Bharat Sabha participated in the protest and expressed their solidarity. Today 17/3/17 I met my brother Dr. G. N. Saibaba at Nagpur Central jail after the undemocratic judgement pronunced by the Gadchiroli sessions court. I waited nearly 4 hrs after applying for the mulakat to meet saibaba. 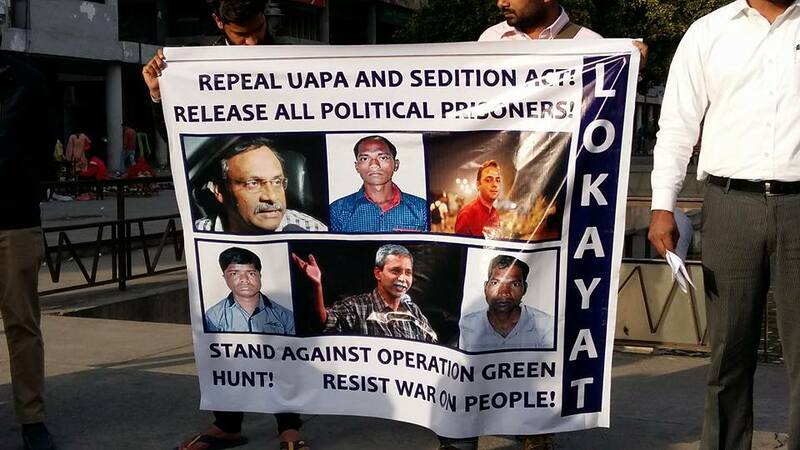 The jail authorities has given mulakat almost at the end of the day around 5.45pm. The jaali mulakat last just in 20 min with two time warnings in between. The new jaali mulakat system is completely undemocratic and inhumane as the window is completely sealed with glass and​ to talk only over telephones on their side of the glass window. When we talk we can’t​ even see the face properly; when face is to be observed we can’t talk. With great difficulty we could able to share few things. Dr. Saibaba looked very weak. He was unable​ to take Jail food. Jail authorities are not providing required diet to him. He is vomiting if any jail food is consumed. He got two times unbearable​ pancreatic pain in the jail. He is suffering from pancreas infection and admitted into hospital just before the verdict. So far no medical treatment has been given to him.Even the basic facilities which were earlier provided are now not extended.today did not accept to give medicines​,bedsheets, fruits etc.his health condition is highly deteriorated. He needs immediate medical treatment.I was not permitted to meet senior jailer to discuss health issues of Dr. G N. Saibaba. Even Hem Mishra’s health is not in good condition. 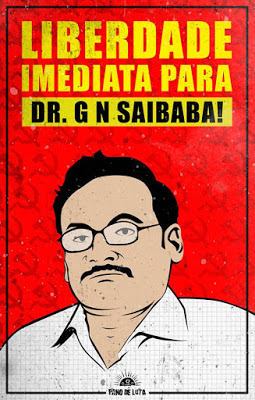 Academics’ and professionals’ appeal against the life imprisonment of Prof. G N Saibaba. It is with utter disbelief and deepest concern that we learn of Prof. G. N. Saibaba, a highly respected intellectual and Asst. Professor in the Dept. of English at Ram Lal Anand College, part of a Delhi University, has been sentenced to life imprisonment under various sections of the Unlawful Activities Prevention Act (UAPA). Prof. Saibaba is wheelchair-bound, 90% disabled with severe and fragile health conditions that warrant constant and now urgent medical attention. 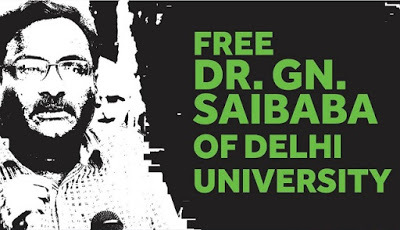 We register our strongest condemnation of the sentence and demand immediate release of Prof. Saibaba and all others accused, and that the concerned authorities conduct a thorough, fair and transparent investigation into the framing of this case. 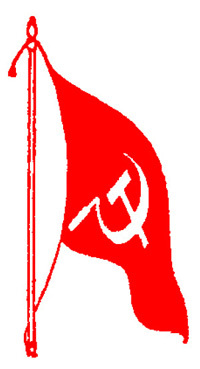 Delhi University Professor G N Sai Baba was convicted on March 7 to life in prison under the Unlawful Activities (Prevention) Act — UAPA — for being a member of a banned terrorist organisation, the Communist Party of India Maoist. The professor, who has undergone two spells of imprisonment in Nagpur jail as an undertrial, is 90 per cent disabled and wheelchair-bound. After his arrest in May 2014, he was released on interim bail on medical grounds in July 2015, only to be rearrested in December that year, and released again on the Supreme Court’s orders in April 2016. Immediately after the conviction, the professor’s wife issued a protest statement that summed up her outrage. Two days later, Rediff.com contributor Jyoti Punwani caught up with Vasantha Kumari. In between tending to a distraught mother-in-law and leaking taps in her Delhi home, Vasantha expressed her shock, bafflement and indignation at what she feels is a terrible injustice done to someone who has only fought for rights guaranteed by the Constitution.